Roses are undeniably one of the most subtle yet beautiful flowers, the single sight of which enthrals our senses. They stand out from most of the plants and bring unique freshness to your garden. However, if you are looking forward to expanding your garden just from a bunch of roses to diversity, you must find the perfect accompaniments for your rose. One of the qualities that these accompaniments should possess is water saving and pest repellant. Since roses are always the star of the show, other plants help in balancing your garden and maintaining other fertility properties. Other crucial properties of companion plants for roses include aesthetics, growing conditions along with the health of the plant. 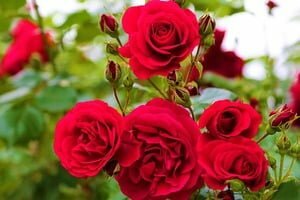 These companions must look good together with the roses and have a beneficial effect towards nurturing them. Perennials: One of the best companion plants for roses are the perennials and tall shrubs. You can plant them in mixed borders. Perennials such as Panarosa make a bold statement in your garden which is why you can plant them one by one in your garden. However, other perennials such as lavender can be planted in a group of three. As a garden rule, you must plant your roses at least 1 to 5 meters apart so that they find enough space for blossoming and not feed on each other’s nutrition. During the first year or two, you must not plant anything close to the roses, as they tend to swallow the plant’s food, leading to incomplete growth. Ultimately, this will result in the quality of your flowers. Anti-pest plants: It is advised to plant companions that discourage the effect on pests in your garden. Since roses can be most affected by pests, they need to be kept around plants that ward off such insects. Although you can use chemicals to keep pests off of your plants, they too have some side effects, which is why pest repellent plants are considered a safe option. It is believed that the plants of the onion and garlic families, enhance the scent of roses and ward off pests such as aphids. For this reason, the quote goes, “Roses love garlic.” Plants such as chives, ornamental alliums also help in preventing black spots over roses. Herbs, Parsley, Thyme, Marigold, are also pest-repelling plants that also promote the growth of the plant. Pollinators: Roses can also be best planted along with popular pollinators. For this reason, there is nothing new in planting vegetable with roses. Roses have been planted along with vegetables since they attract pollinators such as bees, thus promoting the growth of the vegetable. Both the vegetable plantation and the garden roses grow best in moist soil, bright sun and ample watering. You can use climbers or shrub roses and in between them plant vegetables as best gardening practices. Annual plants: If you have a garden, then annuals are must have. They beautify your rose most miraculously and add a tinge of fresh air to your garden. They can be planted in long growing borders especially during the winters when the roses are all set to blossom. In summers you can use plant alyssum, marigolds, dahlia etc. that are short in height and give non-stop flowers all along the season. They also fill the air with a soothing scent. Even Iceland poppies are considered appropriate since they do not have plenty of leaves to interfere with the blossoming process. However, it is advised not to plant annuals too close to roses, since this can create a competitive environment in the soil. Consider the drip line of the rose wisely and plant only beyond this to prohibit any competition of the nutrients between them. Problem solvers: Some of the plants solve crucial problems for the roses. They shine bright and hide the blemishes that may occur in rose’s foliage. The bottoms of the roses can turn sparse and not as sparkling as its flowers. Therefore, lavender, catmint, lady’s flower etc. suppress weeds and keep the roots of the roses cool and pleasant. With plenty of options, you can choose the most appropriate companion plant for your rose, but the only thing to make sure is that they are not planted close enough to the rose. Competition can undermine the blossoming potential of your roses, leaving it unhealthy. Therefore, give roses a bed to grow and nurture.